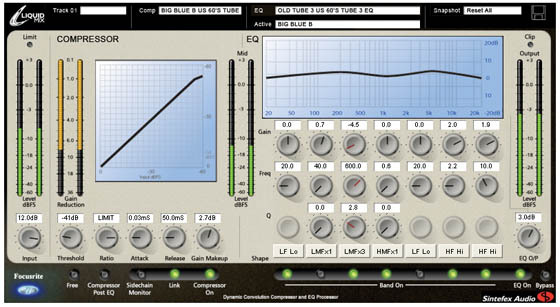 “This is all going to be software,” said a Focusrite rep at an AES show in 2004, as he gestured at racks of Focusrite’s beloved racks of audio gear. (Needless to say, that was not on the record.) While not everything can be digital — you’ll still need to get sound into the digital realm, meaning analog/digital converters and preamps will never go away — it’s astounding what is possible with ever-advancing digital audio tech. And so, we have the incredible Focusrite Liquid Mix: 32 channels of EQ, 32 compressors, all modeling classic and vintage sounds in one cute, compact FireWire case. This tiny bus-powered device does all the number-crunching so your computer CPU doesn’t have to, thanks to onboard DSP chips. Price TBD, but it sounds as though it’ll be well under US$1000. The real magic of this device, of course, is you can have at your disposal dozens of vintage EQs and compressors (Focusrite promises an expanding library online). The secret is real-time audio convolution, the same technique that has been applied to high-quality reverbs. That would be far too CPU-intensive on even a high-end current machine, but with DSP chips it becomes practical. 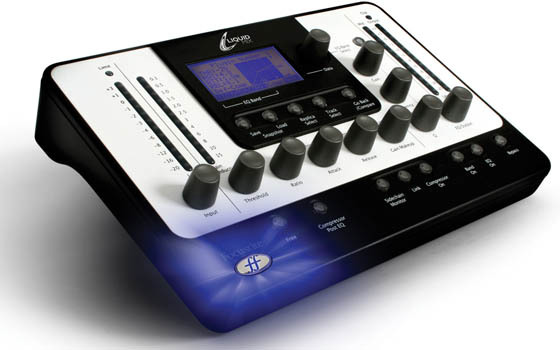 There’s a software interface, of course, but continuing the trend towards tactile controls, Liquid Channel’s hardware includes a full-featured LED display, live meters, and hands-on knobs. And if for some reason this isn’t powerful enough for you, an expansion card will be available. Messe: Adrian Picks – Reason, Other Apps Running Plug-ins?